This, from yesterday's New York Times, is disturbing: "Resentment Toward the West Bolsters Uganda's New Anti-Gay Bill." The worst part may be the reminder that "American evangelical Christians played a role in stirring the anti-homosexual sentiment that culminated in the initial legislation in Uganda." For more on that assertion, see this Harper's story from September 2010 on "the American roots of Uganda's anti-gay persecutions." I think one of the most important principles in this case is that international law, from the time of the Founders to today, uses domestic tribunals, domestic courts and domestic legislation, as the primary engines to enforce international law. This, it seems to me, is something that those who "get" international law understand. Those who remain skeptical about whether international law is "really law," on the other hand, often appear to miss this point. Even with the International Criminal Court, the International Court of Justice, the International Criminal Tribunal for the Former Yugoslavia, the International Criminal Tribunal for Rwanda, the Special Court for Sierra Leone, the European Court of Human Rights, and assorted other international tribunals in existence, few international law cases are heard in international fora rather than in domestic courts. This is why states ought to--and often do--make international human rights norms part of their own law. It is why dealing with corrupt leaders who launder money abroad requires something like the U.S. Kleptocracy Asset Recovery Initiative or the French "biens mal acquis" investigation. And it is why even the U.S. Supreme Court is, from time to time, asked to deal with matters of international law. By a 6-1 vote, Spain's Supreme Court has acquitted Baltasar Garzón of abusing his authority by opening up an investigation of crimes against humanity committed during the Spanish Civil War. This verdict does not set aside an earlier guilty verdict that resulted in Garzón's disbarment. Today the U.S. Supreme Court took up the case of Kiobel v. Royal Dutch Petroleum Co., a case that has its origins in the hanging of the Ogoni Nine in 1995. But that story, too, has a history. It begins with a June 1993 presidential election that returned a mandate for Moshood Abiola. The result was annulled by the military dictatorship; the subsequent political crisis brought Gen. Sani Abacha to power. It was Abacha's oppressive rule that led to the hanging of the Ogoni Nine. But perhaps Abacha's story requires its own historical background, one that would would include Nigeria's colonial past and its struggle to overcome poverty and knit together disparate ethnic groups in the aftermath of independence in 1960. Or perhaps, as with so much of significance in the world, it all begins with the discovery of oil. West Africa--and especially the Gulf of Guinea--is among the world's richest oil regions. Nigeria, Angola, and Equatorial Guinea are major oil producers and, not coincidentally, major centers of political repression and corruption. Nigeria experienced an almost unbroken string of military dictatorships from 1966 to 1999 before returning, haltingly, to democracy; Angola experienced an extraordinarily destructive civil war from its independence in 1975 to 2002 and operates today with a deeply flawed political system; and Equatorial Guinea has been ruled by two dictators--from the same family--since its independence in 1968. Several leaders of the three countries have amassed vast personal fortunes while allowing the abject poverty of their citizens to go unaddressed in any meaningful way. But back to Nigeria, Gen. Abacha, and the Ogoni Nine. The most important oil-producing region of Nigeria is the Niger Delta. Those people living in the region, however, have reaped very few benefits and many hardships from the oil production that goes on all around them. Natural gas--a by-product of oil production--is flared rather than captured in the Niger Delta, resulting in serious air pollution (and one of the single largest sources of greenhouse gas emissions on the planet). Rivers and streams have been polluted making fishing, a key source of livelihood, impossible. Villages have been uprooted and people have been dispossessed to clear areas for petroleum exploration and production. And, in all of this, very little oil wealth has been returned to the people paying the economic, social, health, and environmental costs of the oil production going on around them. Imagine BP ignoring the consequences of the Deepwater Horizon disaster in the Gulf of Mexico in 2010. Now imagine the government deploying the National Guard to keep the people harmed by the oil spill--or merely outraged by it--from interfering as BP and other oil companies continued to operate as if nothing had happened. This gives a picture of the situation in the Niger Delta, one that Peter Maass has described well in his 2009 book Crude World: The Violent Twilight of Oil. Among those protesting conditions in the Niger Delta were members of a group called the Movement for the Survival of the Ogoni People (MOSOP). On May 21, 1994, four former leaders of MOSOP were murdered. The Nigerian government accused nine current MOSOP leaders, including author and environmentalist Ken Saro-Wiwa, of responsibility for the murders. The nine were tried in a special court--the Civil Disturbance Special Tribunal--under circumstances that Amnesty International condemned as "blatantly unfair." All nine were convicted and sentenced to death. In spite of an international outcry, the executions were carried out--by hanging--on November 10, 1995. A number of witnesses later recanted their testimony saying they had been bribed by the government. Two claimed to have been promised jobs with Shell Oil in exchange for testimony against the Ogoni Nine. The international outrage over the executions led to the suspension of Nigeria from the Commonwealth of Nations and variety of sanctions from other quarters. It may have played a role in the end of military dictatorship in Nigeria with the election of Olesegun Obasanjo as president in 1999. It also led to two noteworthy human rights cases, one of which never went to trial. Relatives of Ken Saro-Wiwa sued Shell for its role in his execution, relying on the Alien Tort Statute (ATS) as the legal foundation. On June 9, 2009, just days before the trial was to have begun in New York, Shell, without admitting liability, agreed to pay $15.5 million to settle the case. A second ATS case, Kiobel v. Royal Dutch Petroleum Co., brought by Esther Kiobel, the wife of another of the Ogoni Nine, Barinem Kiobel, had meanwhile proceeded to trial. The Second Circuit Court of Appeals, asked to decide whether a corporation could be held liable for violations of "the law of nations" under the ATS, decided in September 2010 that they cannot. In October 2011, the U.S. Supreme Court granted cert. Oral arguments were heard this morning. The early read on the Supreme Court's position is that the five conservative justices are likely to decide that Big Oil cannot be held liable for human rights abuses under the Alien Tort Statute. If so, an important tool in the global effort to enforce international human rights will have been lost. Next Tuesday, the U.S. Supreme Court will hear oral arguments in Kiobel v. Royal Dutch Petroleum Co., a case that raises the question of corporate liability under the Alien Tort Statute for human rights violations. As Peter Weiss, vice president of the Center for Constitutional Rights, notes in an op-ed in today's New York Times, the Supreme Court granted corporations some of the rights of individuals in Citizens United; to turn around and exempt corporations from the responsibilities that individuals have under the Alien Tort Statute would be a "startling paradox." Meanwhile, on Friday, former State Department legal adviser John Bellinger argued in a Washington Post op-ed that the Supreme Court should uphold the Second Circuit's decision against corporate liability in ATS cases in order to avoid friction between the United States and other governments that have direct ties to corporations accused of human rights violations, like Royal Dutch/Shell. Check back for more on Kiobel and the ATS in the next few days. Over at Opinio Juris, Kenneth Anderson points out a headline in one of the supermarket tabloids that seems to suggest drone warfare is advancing to a whole new level. Perhaps this explains Republican claims that Obama is waging a war on religion. Syria: "Widespread, Systematic and Gross Human Rights Violations"
The Independent International Commission of Inquiry on the Syrian Arab Republic has issued its report to the United Nations Human Rights Council. The report concludes, among other things, that Syrian government forces "have committed widespread, systematic and gross human rights violations, amounting to crimes against humanity, with the apparent knowledge and consent of the highest levels of the State. Anti-Government armed groups have also committed abuses, although not comparable in scale and organization with those carried out by the State" (A/HRC/19/69, para. 126). In an apparent reference to the veto exercised on February 4 by Russia and China of a Security Council resolution designed to pressure the Assad regime to negotiate a settlement of the conflict in Syria, the report notes that "diverging agendas within a deeply divided international community complicate the prospects for ending the violence" (A/HRC/19/69, para. 122). A fire has swept through the Umpiem Mai refugee camp on the Thai-Burmese border destroying approximately 1,000 of the bamboo huts that shelter the camp's 17,000 residents. The Umpiem Mai camp is one of ten operated in Thailand by a consortium of aid groups. Altogether, an estimated 130,000 people, many of them ethnic Karen people who have fled Burmese government repression, live in the camps. The fire, which is believed to have started as a result of cooking in one of the huts, was spread by high winds and dry conditions. There were no deaths, but some children reportedly suffered burns. The Thai government will not allow those who lost their shelters to leave the camp. Aid organizations are promising to help refugees rebuild. Changes in the Burmese government last year together with a peace agreement in January between the government and the Karen National Union, a group fighting for greater autonomy for the Karen people, have prompted hope that refugees will be able to return to Burma (Myanmar). However, most refugees remain fearful of the Burmese government's intentions. For a firsthand description of the Umpiem Mai camp--with photos taken last year--go here. One of the benefits of serving as president of the International Studies Association's West Region is that I can be the first to roll out the Call for Papers for our 2012 annual meeting. And I get to thank program chairs Jennifer Ramos of Loyola Marymount University and Donna Nincic of the California Maritime Academy for their work on what promises to be an excellent meeting. The 2012 ISA-West Annual Meeting will be held October 19-20 at the Pasadena Hilton in the heart of Pasadena, California. We invite paper, panel, and roundtable proposals on any aspect of international studies, including those related to pedagogy within the discipline. We especially welcome proposals related to this year’s theme, Climate Change and Human Security. The predicted impact of climate change on human societies has been a topic of wide-ranging discussion for some years. While there are still “climate deniers” who argue that climate change is not happening or is not resulting from human activity, groups such as the UN Intergovernmental Panel on Climate Change have issued a series of reports detailing predictions for the future in areas of food security, fresh water availability and access, health and the spread/migration of disease, and effects on coastal areas due to rising sea levels and increased storm severity. All of these will have significant consequences on human societies; many will lead to life-threatening challenges for various populations around the world. • What is the impact of various aspects of climate change on human societies? • What are the relative consequences for nations at different levels of development? • Are societies and nations ready to cope (both financially and in terms of logistics and infrastructure) with the predicted increase in, and intensity of, climate-induced natural disasters? • To what extent will women bear a greater burden than men? • What are the possible effects of climate change and climate-induced natural disasters on concepts of sovereignty, statehood, etc.? • How will states and societies cope with a predicted increase in climate refugees? • What is the role climate change may play in future conflicts – both within, and between nation-states? Proposals may be submitted via myISA. Click “My Submissions” on the ISA-West conference page to submit a proposal. If you do not already have one, you will need to create an account in order to access MyISA. Please note that you need not be a member of the International Studies Association in order to create an account. Questions about submissions and registration may be directed to the conference organizers at isawest@gmail.com. The deadline for the submission of proposals is June 1, 2012. Faculty members presenting papers will be asked to serve as chairs and discussants. Please indicate your areas of expertise when you register via MyISA. Please note that those whose proposals are accepted must register before August 1, 2012. Any accepted participant who fails to attend the conference will, except in case of emergency, be excluded from participation in future ISA-West conferences. Three best paper citations—one each for faculty or independent scholars, graduate students, and undergraduate students—will be awarded at the Saturday luncheon reception. CNBC will air an hour-long documentary Thursday night (9:00 p.m. ET/PT) entitled "Filthy Rich." The network describes the program as an "original documentary reported by award-winning Senior Correspondent Scott Cohn and the CNBC Investigations Inc. team. They follow the money around the globe to Dubai, London, Paris and the United States, which is fast becoming a place for the Filthy Rich to hide their wealth." Teodoro Obiang will be among the corrupt rulers of oil-rich states profiled in the documentary. Scott Cohn was in Malibu to conduct interviews and film Teodorin Obiang's $30 million mansion back in September and, as late as last month, I received emails from a CNBC producer looking for some additional information about the estate. The program will include an interview with Lanny Breuer, the assistant attorney general who leads the Justice Department's anti-kleptocracy initative that, in October, filed an in rem suit seeking to seize the Malibu mansion plus another $40 million worth of assets acquired by Teodorin Obiang through corruption. The Defense Advanced Research Projects Agency (DARPA) is working on a robotic "pack mule" to help shoulder the load for dismounted soldiers. What DARPA calls the Legged Squad Support System (LS3) is based on Big Dog and Alpha Dog robot prototypes developed by Boston Dynamics. To see what's going on, take a look at this compilation video of the earlier Big Dog robot from Boston Dynamics. For a more up-to-date presentation on the state of the LS3 program, watch the video of the Alpha Dog featured in this news release from DARPA. The robotics technology is impressive, but it raises the question of what was wrong with this program. An article in today's New York Times ("Balancing Business and Human Rights") describes Chancellor Angela Merkel's effort to balance German economic interests with support for human rights. Germany has recently entered into an agreement with Kazakhstan worth €3 billion for the purchase of rare earth metals needed for certain high-tech manufactured goods. The most recent rankings by Freedom House (Freedom in the World 2012) list Kazakhstan as "Not Free" with ratings of 6 for political rights and 5 for civil liberties (with 7 being the lowest score on a 1 to 7 scale). The report notes that "violent labor unrest in Kazakhstan should remind the world that repression does not in fact lead to stability." Among the most repressed workers in Kazakhstan are the miners responsible for producing the rare earth metals being sold to Germany. Unfortunately, the world's leading producer of rare earth metals--the People's Republic of China--presents its own set of human rights concerns. Germany and other consumers of rare earth metals are between a rock and a hard place. California's iconic In-N-Out Burger has found that software, DVDs, and designer purses are not the only things that get copied in China. A new restaurant in Shanghai called CaliBurger was recently forced to change some of the names of items on its menu. The double cheeseburger has gone from being called the "Double-Double," which is In-N-Out's name, to the "Cali Double." "Animal Style" fries, In-N-Out's name (and, for a time, CaliBurger's name) for french fries topped with cheese and special sauce, is now "Wild Style" fries on the CaliBurger menu. How did In-N-Out manage to get a restaurant in China to respect its trademarks? It turns out that CaliBurger is American-owned and based in Southern California, just like In-N-Out. That made it much easier for In-N-Out to initiate the lawsuit that prompted CaliBurger to settle the case and give up the names "borrowed" from In-N-Out. But--those of you who are familiar with In-N-Out Burger's products--take a look at CaliBurger's food. It appears there's still more than a mere homage to In-N-Out Burger in what CaliBurger is offering. Could it be because CaliBurger's chef de cuisine, Jonathan Wong, is a former In-N-Out restaurant manager? On the other hand, you can't get your vanilla shake at In-N-Out spiked with bourbon the way you can at CaliBurger. As Cheryl Hung, an American in Shanghai, put it, "It's China. Anywhere else and I'd be surprised by a rip-off." Indeed. China, after all, is the home of Pizza Huh, Dairy Fairy, and lots of fried chicken restaurants with three-letter names. To develop a better appreciation of why international cooperation to limit greenhouse gases is so important, take three minutes to watch this animated graphic presentation of atmospheric carbon dioxide levels over time. The graphs were produced and animated by the Earth System Research Laboratory (Global Monitoring Division) of the National Oceanic and Atmospheric Administration. As the scientists' letter points out, it's one thing to disagree on policy responses to a problem such as climate change, but it's something else entirely to distort the facts. The concept of human security is based, in part, on a widening of our understanding of what constitutes a security threat beyond the traditional focus on military threats in the concept of national security. Human security includes concern for military threats, but it also encompasses threats related to food shortages, pollution, poverty, and disease. Health insecurity, in fact, is one of the most persistent and problematic of all forms of insecurity if we judge such things in terms of lethality and impact on quality of life. Consider that the wars of the twentieth century were responsible for roughly 100 million deaths while smallpox (now eradicated) killed somewhere between 300 and 500 million people during the same period. One of the keys to gaining the upper hand in the war with microbes is understanding--and responding rapidly--to the spread of infectious diseases. For humans to continue with business as usual when communicable diseases are running rampant among the population is to give a tremendous assist to the bugs. Especially now, when, for the first time in human history, over half the world's population lives in urban areas, failing to get a flu shot, to cough into a sleeve, to stay home when running a fever, or to avoid crowded spaces can jeopardize the health--and sometimes the lives--of others. The problem, however, is that sometimes infectious diseases are spread before their human carriers even know they are sick. By the time the coughing, sneezing, vomiting, or other unpleasantness arrives, the viruses causing the symptoms may have already been spread. Infectious diseases are often stealthy. The solution, as public health experts have known for a long time, is to ensure that healthy people take precautions against the spread of disease as soon as those less fortunate begin to manifest symptoms. The key to my continued health, in other words, is to take note of your illness and to avoid you (like the plague, as it were). But if I take note of your illness only after you've shaken my hand or sneezed in my general vicinity, it's too late. I may already have what you have. The key, therefore, is public monitoring and reporting of the fact that an infectious disease is making its way through the local population. Public health authorities in every state of the United States and in most of the world's countries collect information regarding the spread of infectious disease. In fact, laws mandate that hospitals and clinics report on the incidence of various diseases that have been diagnosed and treated. Massachusetts, in 1874, was the first state in the United States to initiate the systematic reporting of illness by physicians. Michigan, in 1883, was the first to require such reports. Today, the Centers for Disease Control and Prevention (CDC) collects aggregate data on disease and mortality from the states. The World Health Organization (WHO) performs a similar function on the global level. Reporting of this type is essential for epidemiologists. It can help health care providers to know what is happening when people start appearing for treatment with symptoms that could be explained by a variety of different conditions. It can allow pharmaceutical companies to know when to ramp up production of particular vaccines and where to ship those that they have produced. But it may not be timely enough to let me know that I shouldn't ride the subway into work tomorrow because a bunch of people in my city starting coughing and sneezing in just the last 24 hours and some of them are likely to tough it out and go to work tomorrow in spite of the fact that they're spewing pestilence. There are some, ahem, bugs to be worked out, no doubt, but the concept seems to be full of potential. John Metcalfe of The Atlantic reports on Sickweather here if you need a bit more information. There's much to be learned about human behavior, and threats to human security, by mining our online data. In fact, I suspect one could track (and issue warnings about) outbreaks of karaoke, wine snobbery, and Angry Birds expertise in much the same way that Sickweather is handling illness. "Red nose at morning, sailors take warning." Seriously, you should check out Sickweather just for its ever-changing tag lines. Even as the United States Department of Justice seeks to prove that Teodoro Nguema Obiang's Malibu mansion, assorted sports cars, Learjet, and Michael Jackson memorabilia are the products of corruption and therefore subject to seizure, the French government is moving in the same direction. As part of a corruption probe popularly known in France as "BMA" (for biens mal acquis, or ill-gotten goods), French authorities raided TNO's Paris home at 42 Avenue Foch earlier this week. The Equatoguinean government responded Thursday with this statement: "The government of Equatorial Guinea expresses its total indignation and protests against the illegitimate persecution by French authorities on an apartment of the state . . . in Paris, in flagrant violation of international conventions." Of course, "the government of Equatorial Guinea" is TNO's father, Teodoro Obiang Nguema Mbasogo, who runs the country as a family-owned criminal enterprise. The "international conventions" to which the statement refers are those related to diplomatic immunity, and especially the Vienna Convention on Diplomatic Relations of 1961. The Obiang family argues that TNO's Paris residence is protected by diplomatic immunity because TNO was appointed by his father last October to be Equatorial Guinea's deputy permanent representative to UNESCO, which is headquartered in Paris. The French government is apparently unpersuaded by the argument. In 1998, Francis Fukuyama argued in an article for Foreign Affairs that, as women gain access to power across the world, the world is becoming a more peaceful place. The "democratic peace," Fukuyama suggested, may in fact be a consequence of the feminization of politics. He noted that "developed democracies . . . tend to be more feminized than authoritarian states, in terms of expansion of franchise and participation in political decision-making. It should therefore surprise no one that the historically unprecedented shift in the sexual basis of politics should lead to a change in international relations." Today, in a column published online by Aljazeera, Harvard professor and former assistant secretary of defense Joseph Nye considers whether a world run by women would be a more peaceful place. Harvard psychologist Stephen Pinker, he notes, has argued in a recent book (Better Angels of Our Nature) that "over the long sweep of human history, women have been and will be a pacifying force." Nye, endorsing this view, suggests that the connection between women and peace may be due in part to differences between women and men in leadership style: "Women's non-hierarchical style and relational skills fit a leadership need in the new world of knowledge-based organisations and groups that men, on average, are less well prepared to meet." Progress has occurred at a glacial pace, but when we look at certain benchmarks in the not-too-distant past we can find reason for optimism. In 1900, no country in the world allowed women to run for elective office at the national level. Jeannette Rankin, the first woman elected to Congress in the United States, was elected in 1916. (She remains the only woman ever elected to Congress from Montana.) Today, wherever men can vote, women have won the right to vote as well (with women's suffrage in Saudi Arabia coming in 2015). The future, in all likelihood, belongs to women. And that is probably a good thing for all of us. "Everybody knows that if you are doing business in China, in the 21st century, you don't bring anything with you." The "anything" to which cybersecurity expert Jacob Olcott refers is anything electronic. And why? Because the Chinese are remarkably adept at stealing data from computers, cell phones, or any other devices carried by travelers to China. The New York Times describes the problem in this rather unsettling article. Amnesty International presents a brief summary of the dramatic events in North Africa and the Middle East since 2011. (A human rights revolution from Amnesty International on Vimeo). Baltasar Garzón, the Spanish judge who, in 1998, issued an international warrant for the arrest of former Chilean dictator Augusto Pinochet and, in 2008, initiated an investigation of crimes against humanity committed during the Franco regime, has been found guilty of illegally ordering wiretaps of lawyers' conversations with clients in a political corruption case. While Spanish law permits such wiretaps in terrorism cases, it is vague concerning their permissibility in other cases. Garzón was convicted by a panel of judges in Spain's Supreme Court, fined, and removed from the bench for eleven years. There are additional legal problems for Garzón. A second trial, also on charges of exceeding his legal authority, has just concluded. Garzón is accused of opening the investigation of the Franco regime's crimes in violation of a 1977 amnesty law. He told the panel hearing that case that he was motivated by "the helplessness of the victims." A verdict is expected to take weeks. Right-wing groups in Spain have resented Garzón's international fame and have been angered by his interest in digging up Spain's troubled past. Garzón, on the other hand, has viewed the investigation of Spanish crimes against humanity as a logical extension of his international investigations. According to one of Garzón's attorneys, Gonzalo Martinez-Fresneda, "The question that Garzón was always asked is: 'Why are you prosecuting Pinochet, why are you going after the Argentinean dictators, why are you after the Nazis, but you're not investigating the war crimes committed in Spain?" There remains the possibility that Garzón might be able to end his career as a prosecutor at the International Criminal Court. He served as a consultant to the ICC after his suspension from the bench in Spain. The United States' economic embargo against Cuba has now been in place for half a century. President John F. Kennedy imposed what Cubans call el bloqueo by means of an executive order in February 1962, soon after Pierre Salinger, his press secretary, delivered 1,200 Cuban cigars to the White House. On October 3, 2008, President George W. Bush signed into law the Child Soldiers Accountability Act, introduced in 2007 by Senator Richard Durbin and passed unanimously in both the House and the Senate in September 2008. The act, which has extraterritorial reach, makes it a federal crime to recruit or use children under 15 as soldiers. Yesterday, a federal immigration judge ordered the deportation of George Boley, a former Liberian warlord, under the terms of the Child Soldiers Accountability Act. It is the first time the Act has been used for this purpose. According to a story in the Rochester (N.Y.) Democrat and Chronicle, Boley is a longtime resident of Clarkson, New York. He attended college almost forty years ago at the College of Brockport where he earned a bachelor's and a master's degree before earning a Ph.D. at the University of Akron. He was a minister in the government of Samuel Doe, but came to the United States in 1990 following Doe's murder. In 1993, Boley returned to Liberia as the leader of the LPC. Boley has been in federal custody for the last two years while fighting deportation. There is a common misconception that international human rights are enforced only when the leader of an abusive regime--Sudan's Bashir or Syria's Assad, for example--is captured and transferred to an international court or when the Security Council musters the necessary votes to impose sanctions or authorize humanitarian intervention to halt human rights abuses. These things do happen on occasion, but only when state interests (especially among the permanent members of the Security Council) are aligned properly. The Russian and Chinese veto of a Security Council resolution calling for the ouster of Assad in Syria last week, with what appear to be tragic consequences, offers an example of a political failure to enforce human rights. The Syrian case is especially tragic because innocent people are being killed by government forces as an authoritarian regimes clings to power. But the international human rights regime deals with far more than threats to life and liberty. There are many other human rights that require monitoring, and occasionally enforcement, under circumstances in which neither the Security Council nor a hegemonic state is likely to take much notice. Sometimes, in fact, it is the hegemonic state that needs a dose of enforcement activity. How are human rights enforced in these circumstances? Unfortunately, budget cuts in California have weakened the state's commitment to an educational system that is "free to all," at least in its primary and secondary stages. To compensate for declining revenues, many school districts have asked students and their families to pay for athletic uniforms, art supplies, and even workbooks for Spanish classes and novels for English classes. In September 2010, the American Civil Liberties Union (ACLU) filed a class action suit on behalf of students forced to pay fees for a variety of required educational materials. One student paid $440 annually for various fees, an amount that presented a financial hardship for the family. Two weeks ago, Los Angeles Superior Court Judge Carl West denied a motion to dismiss filed by the state. Meanwhile, Assemblyman Ricardo Lara is pushing legislation that will require school superintendents to monitor all schools under their supervision to ensure that illegal fees are not being imposed in violation of the constitutional--and international human rights--requirement that the state provide a free public education. This is how international human rights ought to be--and sometimes are--enforced. A particular right such as the right to a free public education, expressed in general terms in international law, is incorporated into the constitutional or statutory law of individual states in a form appropriate to the local culture. Robust civil society groups, such as the ACLU in the United States, monitor compliance with the law and, when necessary, go to court to demand compliance, even as legislatures act to strengthen the law. Last October, People for the Ethical Treatment of Animals (PETA) filed suit in federal court alleging that five orcas kept by SeaWorld (three in San Diego and two in Orlando) are being held in slavery in violation of the Thirteenth Amendment to the Constitution. Jeffrey Kerr, PETA's attorney, has said that this is "the next frontier of civil rights." Today Judge Jeffrey Miller heard arguments related to SeaWorld's motion to dismiss the suit. There's certainly a case to be made that orcas should not be held in captivity, but antislavery law is probably not the best foundation for that case. Article 26 of the Universal Declaration of Human Rights states, in part, that "everyone has the right to education." It is a right that is central to the plot of a beautiful film called The First Grader. Based on the true story of Kimani N'gan'ga Maruge, a Kenyan who, at age 84, insisted on attending primary school so that he could learn to read after Kenya instituted free primary education for all, The First Grader is more than simply a cute "old man goes to school with six-year-olds" film. In frequent and sometimes very intense flashbacks, we learn that Maruge fought against the British in the Mau Mau Rebellion of the 1950s. While historians are divided over the significance of the rebellion in terms of its impact on Kenyan independence (which came in 1963), the Mau Mau rebels have been honored in Kenya for their contributions to the cause. The First Grader also touches on the brutality of the British response to the Mau Mau Rebellion, an issue that continues to attract attention in spite of the fact that the British have been gone from Kenya--the former British East Africa--for almost fifty years. In April 2011, the British Foreign and Commonwealth Office admitted that it had withheld thousands of documents relating to the treatment of Mau Mau detainees in Kenya in spite of repeated requests for their release. Shortly thereafter, a British court gave four Kenyans the right to sue the British government for human rights violations. Historian David Anderson noted in The Guardian last summer, "Of the four elderly Kenyan plaintiffs who brought this case, two were allegedly the victims of castration, one claims to have been savagely beaten and left for dead on a mortuary slab, and another was allegedly the victim of repeated sexual abuse--all acts conducted during British 'interrogation' of suspects against whom no crime had been proved." Perhaps what makes The First Grader work so well is the contrast it poses between the brutality of Kenya's colonial past and the hope for the future that free universal education offers. Both came together in the person of Kimani Maruge, who died in 2009 at the age of 89. Kaing Guek Eav, also known as Comrade Duch, had his conviction upheld and his sentence increased by the Supreme Court Chamber of the Extraordinary Chambers in the Courts of Cambodia (ECCC) earlier this week. The ECCC was established as a mixed Cambodian-international tribunal to try those responsible for the Cambodian genocide of 1975-79. In less than four years, the Khmer Rouge regime led by Pol Pot killed approximately 1.7 million Cambodians, or roughly a quarter of Cambodia's population. Duch was head of a prison--S21--in Phnom Penh called Tuol Sleng. Nearly all of the approximately 15,000 people who passed through Tuol Sleng were killed. Duch was convicted of crimes against humanity and grave breaches of the Geneva Conventions in July 2010 in the first trial conducted in the ECCC. He appealed the verdict in March 2011, claiming that, as a junior official in the Khmer Rouge, he was merely following orders on pain of death. His argument was rejected by the court, which increased his sentence from 35 years to life in prison. Judge Kong Srim called Duch's crimes "among the worst in recorded history." Even those who dream in color are likely to imagine World War I in black and white. The vast majority of the images that have come down to us, both photographs and a few movies, are monochromatic. Even All Quiet on the Western Front, the classic film about World War I that was released in 1930 is available only in black and white (having apparently escaped the colorization efforts of Turner Classic Movies). There is, however, a trove of color photographs from World War I available online. 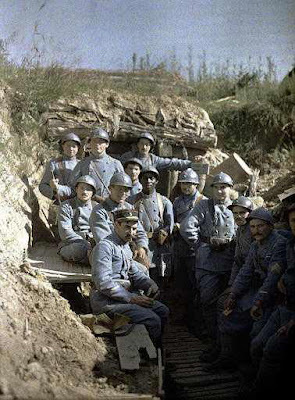 The photographs were taken by the French army during the last two years of the war using a color film that had been developed by Auguste and Louis Lumiere in 1907. Here's one showing French troops posing in a trench. One of the points that comes through in even a very cursory look at the photographs is the extent to which the war was in fact a world war. There are soldiers pictured from various French colonies including Senegal, Algeria, and Indochina. Woodrow Wilson's call for national self-determination must have been very unnerving to allies fighting the war with considerable help from their colonies. Who owns the Internet? A better question, and one more pertinent to understanding some of the major issues in international politics today, is Who governs cyberspace? Some, including many of the Internet's most obsessive users, argue that no one governs cyberspace, nor should anyone attempt to govern it. The Stop Online Piracy Act (SOPA) and the PROTECT Intellectual Property Act (PIPA), two bills that were, until last week, moving through Congress at the behest of major economic interests concerned about Internet piracy, were derailed because many netizens rebelled against this particular effort on the part of government to regulate cyberspace. It was not the first time that the Internet had "organized," in its own disorganized fashion, to fight back against attempts to rein in the anarchy of cyberspace. Saki Knafo, in a two-part story for the Huffington Post entitled "Anonymous and the War over the Internet" (see Part I and Part II), describes the "Chanology War of 2008" in which the Church of Scientology found itself under "attack" on the Internet and being protested--in a non-virtual way--on the sidewalks of 142 cities around the world for having pressured YouTube into removing a video of Tom Cruise rambling incoherently about Scientology. Knafo regards this as the point at which the geeks gathering in certain IRC rooms began to realize they had the power to influence events irl (in real life). The success in organizing anti-Scientology protests worldwide earned public recognition for a movement--if that is the right word--called "Anonymous." Anonymous has no leaders, no hierarchy, no formal structure of any kind, and no members, in the usual sense of that term. It does, however, have an ethos, one which is focused on preserving cyberspace as an unregulated sphere of activity--an anarchical society, if I may use the term Hedley Bull applied to the realm of international relations. Consequently, Anonymous acts (and that generally means hacks) in defense of Julian Assange and WikiLeaks or Kim Dotcom and MegaUploads or others thought to be victims of efforts to curb Internet freedom. It is not immediately clear how we ought to conceptualize cyberspace in terms of its relationship to government. The U.S. Department of Defense (and other military organizations around the world) view it as the "fifth domain" of conflict (after land, sea, air, and outer space). It is a realm of espionage and warfare--that is, another space in which U.S. national security interests must be defended. The U.S. Department of Justice and the Department of Commerce see cyberspace as a medium of economic activity, but also a criminal wasteland. It is a domain in which terrorists plot, digital pirates steal intellectual property, and hackers routinely defraud the Internet's most gullible users (your grandmother, perhaps) and occasionally wreak havoc on its most sophisticated users (your bank or credit card company). The U.S. Department of State regards cyberspace as a tool for the spread of liberal values across the world. What must be defended in this conception are free access to uncensored information and free expression of political views. Other parts of the U.S. Government view cyberspace as a venue for the dissemination of information, a tool for advanced communications, a means of spreading educational opportunity, or a forum for advocacy. Cyberspace is all of these things and much more. Norms for the governance of cyberspace are emerging, but not easily. There are clashes of interests being played out between states (e.g., China and the U.S.) because states see themselves as the logical sources of regulation where regulation (perhaps in the form of arms control or copyright protection) is needed. But here, as in so many other aspects of the emerging post-Westphalian system, states are not the only actors with interests and the ability to advance them forcefully. As Anonymous has demonstrated on numerous occasions, there are cybercitizens who in a very real sense live in cyberspace and see it as territory to be defended against the encroachments of governments, corporations, international organizations, or interest groups. And this fact adds a layer of complexity to efforts to develop forms of governance for this new anarchical society.